I am a big fan of Suzi Eszterhas. We have reviewed her Eyes on the Wild series and Koala Hospital. A wildlife photographer, her books are scrumptious, as well as informative. Eszterhas supplies an engaging narrative full of animal facts, beautiful color photos mirror what is explained in the text that makes her books extremely eye catching. In Moto and Me, Eszterhas explains, “As a child, I used to tell my mom that one day I would live in a tent in Africa. 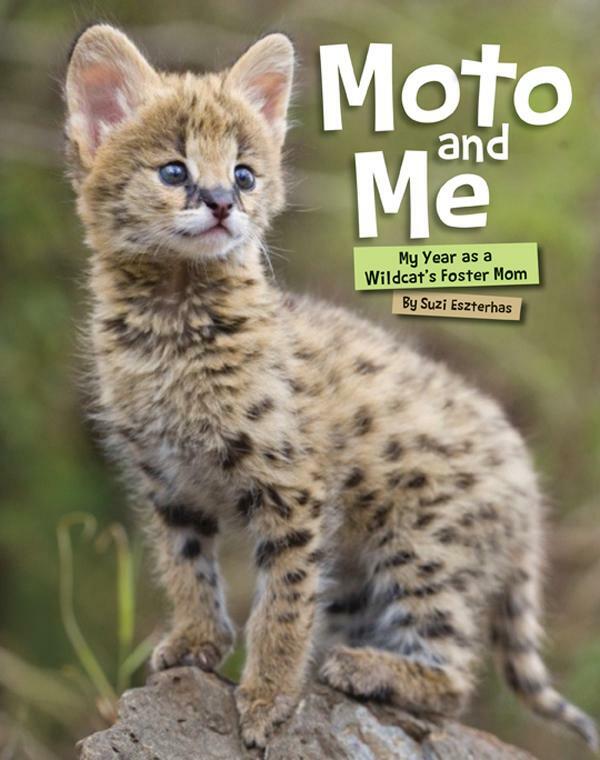 So it was a dream come true when I headed to the Masai Mara, a wildlife reserve in Kenya, to photograph animals.” Little did she know that soon she would become a foster mother to a two-week-old serval kitten! 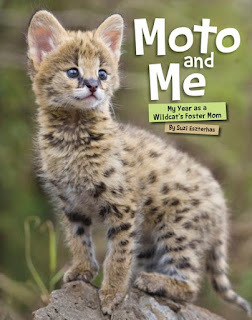 She gave it the name, Moto, which means “Fire” in Swahili, the language spoken in the Masai Mara. The gorgeous, full page photographs follow the kitten as it grows from a tiny baby to full size, ready to live on its own. Eszterhas narrative balances the tremendous responsibility of raising a wild animal with a scientist’s eye. Then, eight months later, “one night, Moto didn’t come to my tent. I woke up in the morning very worried. The day passed without any sign of him, and then the next and the next. I was terrified that something bad had happened to Moto." Eszterhas spots the serval a week later. Moto had successfully returned to the wild. Though no resources for further reading, the author includes facts about Servals, which are at risk in some parts of Africa due to loss of habitat and…sadly, are hunted for their fur.